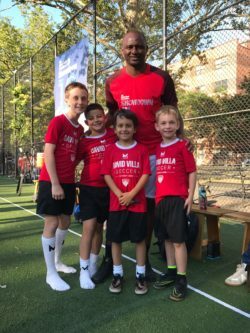 New York City — Ahead of Steve Nash Foundation’s annual celebrity soccer match, DV7 Coaches hosted a clinic 50 players from various New York City organizations. 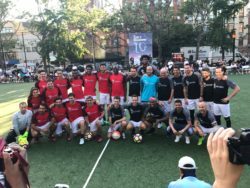 In Sara Roosevelt Park, the players received soccer training from DV7 coaches, met and spoke to David Villa, and then sat on the sideline for the annual celebrity soccer match. The match raised funds for the Steve Nash Foundation and featured famous names from the world of soccer and basketball. Soccer players such as Patrick Viera, Christian Fuchs, Claudio Reyna, Saloman Kalou, and Dwayne De Rosario mixed with basketball stars Steve Nash, Joel Embiid, Jeremy Lin, and Rondae Hollis Jefferson. The two teams were coached by David Villa and Sacha Kljestan of the New York Red Bulls, days before the NYC Derby.